Introduction of non-native lake trout in Yellowstone Lake has affected organisms from the microscopic level in the lake to large animals in the region, according to newly published research. Zooplankton, cutthroat trout, river otters, osprey, bald eagles, bears and, likely, elk are among the creatures whose numbers, diet and behavior have been altered as a result of the presence of the invasive fish, says an article that appears today (March 20) in the scientific journal Science Advances. 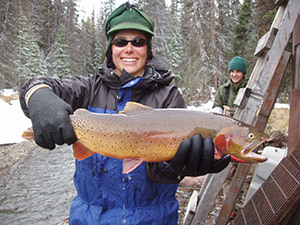 The authors include Lusha Tronstad, research scientist with the Wyoming Natural Diversity Database at the University of Wyoming; National Park Service scientists Todd Koel, Jeffrey Arnold, Kerry Gunther, Doug Smith and Patrick White; and John Syslo of the Montana Cooperative Fishery Research Unit at Montana State University. The scientists analyzed data spanning more than four decades, from 1972-2017, and concluded that the impact of lake trout in Yellowstone Lake -- in particular, the decline of native cutthroat trout -- has cascaded across the lake, its tributaries and the surrounding ecosystem. “Our study illustrates the potential impact of a single, invasive predatory species on otherwise pristine ecosystems,” the researchers wrote, providing further support for Yellowstone National Park’s efforts to suppress the lake trout population in Yellowstone Lake. Monitoring over the past three decades has shown a dramatic drop in the numbers of native cutthroat trout that inhabit Yellowstone Lake and spawn in its tributaries, largely as a result of the illegal introduction in the 1980s of lake trout -- which prey on cutthroats and spawn at depths inaccessible to bears, birds and other animals. -- The size of zooplankton in the lake increased, as fewer cutthroat trout were there to consume them. That has brought about an increase in the lake’s water clarity, a likely factor in a slight rise in the lake’s surface water temperature during summer. -- Fewer spawning cutthroat trout in tributary streams reduced the transport of nutrients such as ammonium into those streams. -- The density and success of osprey greatly declined, as they’re unable to prey on lake trout, which live at inaccessible depths. In fact, while there were an average of 38 osprey nests at Yellowstone Lake from 1987-1991, only three were observed from 2013-17. And those birds have been leaving the lake to forage in large lakes of the upper Snake River, at least five miles away. -- Bald eagles shifted their diet to compensate for the loss of cutthroat trout. Even with that shift in diet, the average number of bald eagle nests on Yellowstone Lake dropped from 11 in 2004-08 to eight in 2013-17. And nesting success dropped from 56 percent in 1985-89 to zero in 2009, before rebounding to 70 percent during 2013-17 as the eagles found alternative food sources. Bald eagles at Yellowstone Lake have been seen more frequently preying on common loons, trumpeter swan cygnets and young white pelicans, possibly contributing to declines in those bird numbers as well. -- Otters, which relied on cutthroat trout as a primary food source, have shifted their diets to longnose suckers and amphibians. While there are no estimates on otter numbers in Yellowstone Lake and its tributaries before the introduction of lake trout, the estimate in 2008 -- one otter for every eight miles of shoreline -- is among the lowest ever reported for a river otter population. -- Black bears and grizzly bears, for which spawning cutthroat trout had been an important food source, had to seek alternatives. The estimated number of spawning cutthroats consumed annually by grizzlies declined from 20,910 in the late 1980s to 2,266 in the late 1990s to only 302 in the late 2000s. Despite the cutthroat trout decline, grizzly bear abundance throughout Yellowstone National Park has remained stable. Those “other foods” likely include elk calves. Each spring, thousands of elk that winter on lands at lower elevations migrate to the interior of Yellowstone, and elk calves born in the Yellowstone Lake area are vulnerable to predation, especially during the first few weeks after birth. The researchers say the reintroduction of wolves to Yellowstone starting in 1995 -- the year following the discovery of lake trout in Yellowstone Lake -- did not play a role in the shift in diet for bears in the Yellowstone Lake area. While grizzlies prey upon elk calves primarily during the first few days after birth, wolves and other predators kill elk calves later in the summer and winter. The scientists also discount the idea that Yellowstone’s massive 1988 wildfires are responsible for the cutthroat trout decline. The scientists noted that extensive gill-netting of lake trout over the past 24 years has begun to help the cutthroat trout population in Yellowstone Lake.